Quakers meet together in silence believing that the Holy Spirit, however perceived, will lead us to worship. Any person who feels moved to do so may speak at the meeting. We believe that God exists in everyone, so that anyone can experience divine love and guidance. Quakers have great diversity of belief, and while words can divide us, the shared experience of silent worship, seeking to practice Christ’s message of love and compassion unites us. We know ours is not the only path to God, but believe it is the right one for us. Quakerism is rooted in Christianity. We are formally known as the Religious Society of Friends. Currently, there are just over 1,500 members in Ireland. The centre of Quaker spiritual life is the Sunday Meeting for Worship. Click on one of the 28 Meetings throughout Ireland for details of the nearest one to you. The best way of finding out about Quakers is to go to a Meeting for Worship. helping the oppressed at home or abroad in a variety of ways. Many Quakers simply try to be as useful as possible wherever they are, with whatever talents, big or small, they have been blessed with. Quakers in Cork – Quakerism was first brought to Cork by Elizabeth Smith and Elizabeth Fletcher in 1655, soon after the beginning of Quakerism in the North of England in 1652. Some of the first Quakers were Cromwellian soldiers, who saw that violence and fighting were not consistent with the peaceable message of Jesus Christ. The Quaker Meeting House at Grattan Street was originally built in 1678. The building as it now stands was completed in 1834, when there were about 280 Quakers in Cork. The new meeting house erected in 1939 next to the Quaker Burial Ground at Summerhill South still serves Cork’s growing modern Quaker community. William Penn (1644-1718), who founded Pennsylvania, which became a refuge for people all over Europe who sought religious tolerance. The baker William Martin (1772–1853) was a leader of the teetotal movement, and it was he who persuaded Theobald Mathew, known as Fr. Mathew, to take up the cause of teetotalism. A Youghal Quaker, Anna M. Haslam (1829–1922) was a pioneering feminist. 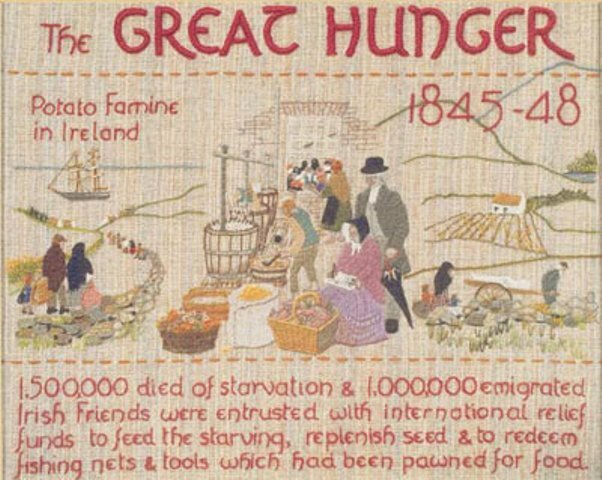 Quakers are often remembered in Ireland for their role in alleviating distress during the “Great Hunger”. In 1846, the Quakers set up a famine relief committee. Ebenezer Pike offered a premises at Adelaide Street and obtained large iron boilers to prepare soup, which was provided at one penny to each who had that much to spare, or else it was given free. Quakers are remembered for what they did after the potato crop in Ireland failed in 1846 for the second year running. When they realised the seriousness of the famine, straight away they formed a committee to give help. The joint secretaries were Joseph Bewley and Jonathan Pim. Funds, food and clothing were sought from Quakers in England and America.